This selection of papers by major scholars introduces students to the history of the book in the West from late Antiquity to the publication of the Gutenberg Bible and the beginning of the print revolution. The collection opens with wide-ranging papers on handwriting and the physical make-up of the book. In the second group of papers the emphasis is on the ’look’ of the book, complemented by a third group dealing with scribes, readers and the availability of books. 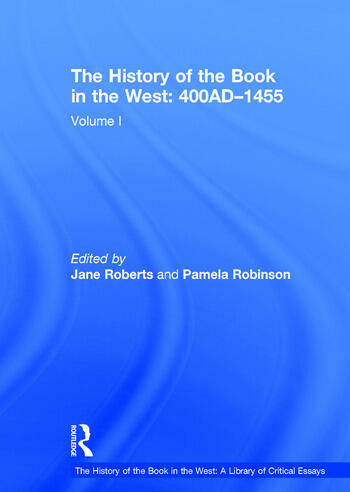 The editors’ introduction provides an overview of the medieval book. Contents: The history of the manuscript book, 400AD-1455: an overview; Part I Introductory: Aspects of palaeography, T. Julian Brown; The bibliography of the manuscript-book, G.S. Ivy. Part II The Look of the Book: From 'above top line' to 'below top line': a change in scribal practice, N.R. Ker; The circulation of glossed books of the Bible, Christopher de Hamel; The influence of the concepts of ordinatio and compilatio on the development of the book, M.B. Parkes; The 'booklet': a self-contained unit in composite manuscripts, P.R. Robinson; Describing medieval bookbindings, Graham Pollard. Part III Copying, Dissemination and Readership: The preconditions for Caroline minuscule, David Ganz; How fast did scribes write? Evidence from Romanesque manuscripts, Michael Gullick; French Bibles c. 1200-30: a new look at the origin of the Paris Bible, Laura Light; University jurisdiction over the booktrade: the family of Guillaume de Sens, R.H. and M.A. Rouse; Printing, mass communication, and religious reformation: the Middle Ages and after, David d'Avray; The Book of Hours, Roger S. Wieck; The production of copies of the Canterbury Tales and the Confessio Amantis in the early fifteenth century, A.I. Doyle and M.B. Parkes; A new type of book for a new type of reader: the emergence of paper in vernacular book production, Erik Kwakkel; Vespasiano da Bisticci as producer of classical manuscripts in fifteenth-century Florence, Albinia C. de la Mare; Literacy, reading and writing in the medieval West, Charles F. Briggs; Regulations for the operation of a medieval library, Robert D. Taylor-Vaisey; Name Index.